Previous postIs the party over yet? Well I never, didn´t know that. Will have to ask more questions next time I buy! I love the tentacles too…gorgeous. 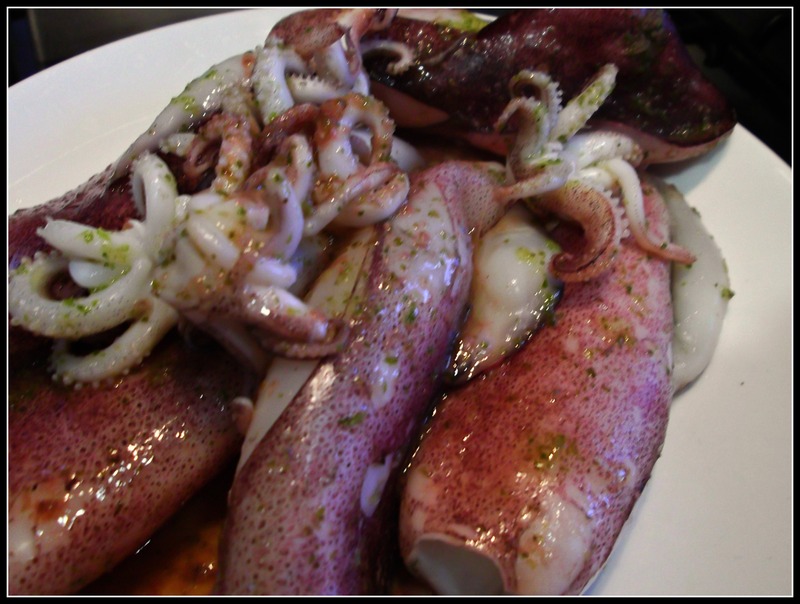 I love squid – a la Romana, griddled, a la plancha, barbecued……these look great! That plastic bit is always a bit of a surprise, isn’t it? Yes – if you miss it you feel like you´re eating a price tag! I don´t have any choice here 😦 I have to DIY, but am now super quick at doing it! I know what you mean – when it all slides out cleanly, there´s a certain satisfaction! mmm… I’ll leave all that squidding to you and just munch down my calamari rings… you’re amazing, I don’t know how you did any of that, but one day, surely, maybe, I’ll give it a go myself! Squidding…love it! You´ve invented a new verb 🙂 Calamari rings are good too! Oh yes, didn´t realise it even showed up in the photos, but I´m a lefty! Are you?! Nope, I’m a righty – is there even such a word 😉 Although, I do do a lot of things left handed and wear my watch light a lefty for what that’s worth. How funny – I do most things apart from write and cook (i.e. use a knife) with my right hand…we´re both a bit odd, in a good way! 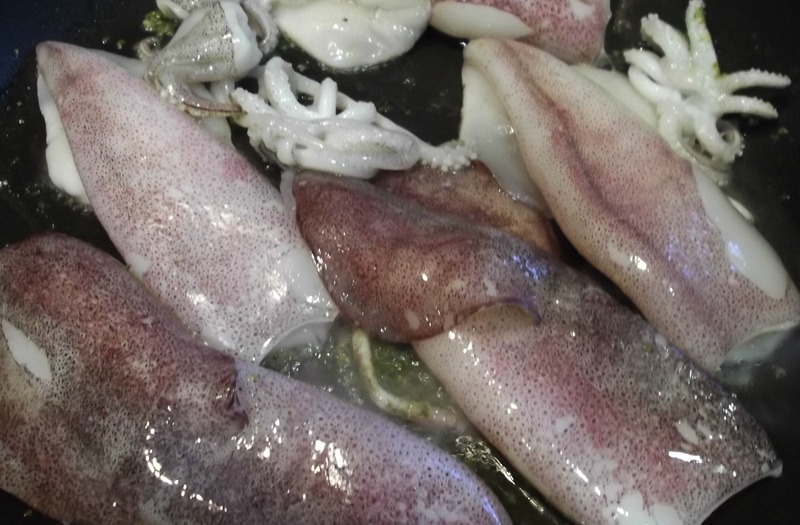 I love squid and this recipe looks extremely delicious. Have to try this this weekend when I can get squid in the open market. Thanks for the recipe and inspiration! Thanks Malou – don´t know if it´s expensive for you where you are, but even if you can only get a little it´s great in fish soups too! great photos and post but sorry, no thanks, just give me some good ole Southern grits! They´re good too … you´ll have to “show” me how to make them properly! I love squid and this reminds me that it’s been awhile since I’ve made it at home. This is a perfect recipe for my weekend! Well, Tanya, you know how I feel about these beauties! Great tutorial on how to clean and cook ’em. Your grilled calamari look wonderful! I can get them fresh without any problems. For frozen, I’ve found the Asian markets have an incredible selection and a wide range of sizes. It just depends upon how they’re to be used. Glad you liked it – when I was in London I often chose frozen over fresh from the Asian supermarkets for the choice (and I am sure they were probably often “fresher” than the fresh)! 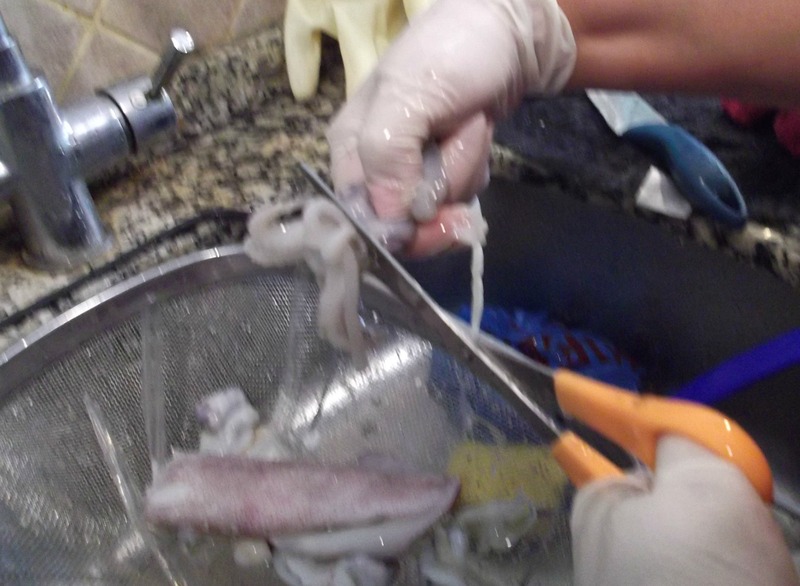 I’m very lucky my little Italian market cleans my squid for me!! I just don’t think I can do it!! I like the easy, quick recipe. I’m always thinking I need to do so much more, but the simpler is the better!! Lucky you – although if we buy them frozen they are often cleaned! Simple is good but so is fancy…it just depends on how much time you have that day. There’s a running joke in our house that if I’m cleaning squid or making salsa I will ruin my shirt. I should probably get an apron one of these years. Anyway, great tutorial here! I have a lovely “Flamenco” one that would suit you! 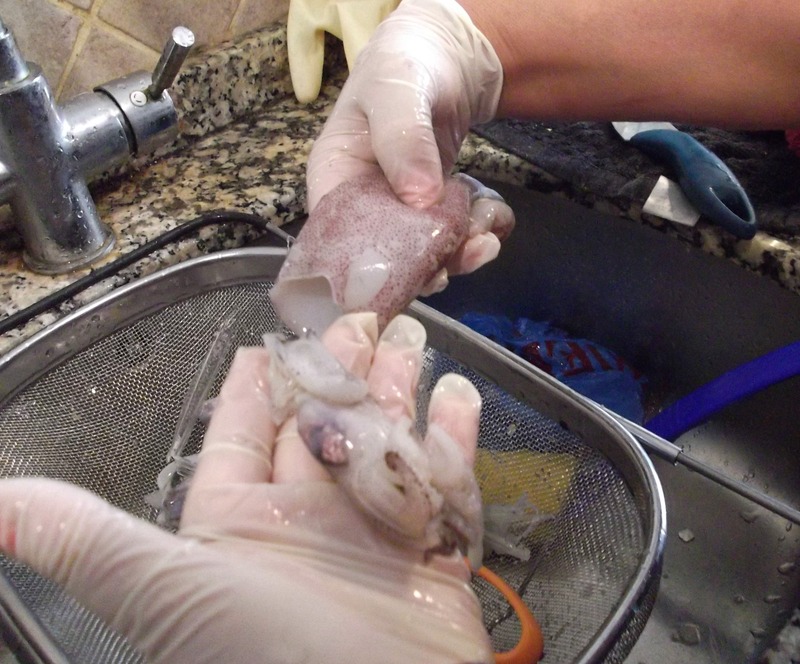 I’ve only once been involved in the complete process of squid cleaning. Yes, it was for a tapas party, and yes, it turned out fabulously, so it was completely worth the effort for a big house-full of friends (plus, I was only ‘assistant’ at that station, since I had pork rolls to attend at my primary assignment on the occasion). Thanks for bringing back a very happy memory! 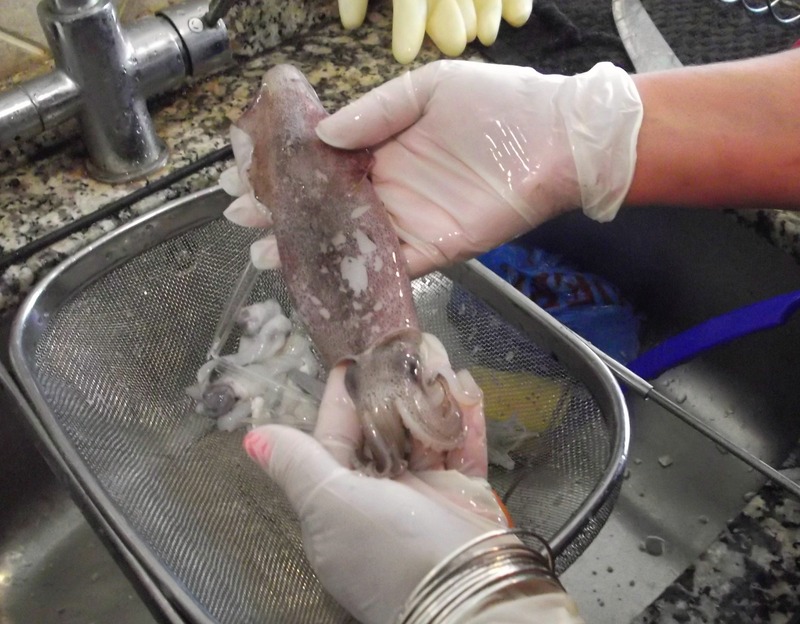 We get fresh squid pretty much year-round, but more in the early summer. I haven’t cleaned it in years, but you’re right about how easy it is! You´re like us then – and it´s really not that tricky to clean, it just looks a little daunting! That squid looks so fresh! I love this recipe, I love how you prepared it. Mmmmmmmm!!! I love squid, and this is one of D-Man’s favorite way of cooking fish. You make the cleaning part look so easy! Your cooking tips have really helped me so much along the way, especially when it comes to seafood! Ah, thank you, but I bet your Suegra was helpful too! We love squid and eat a lot of it. 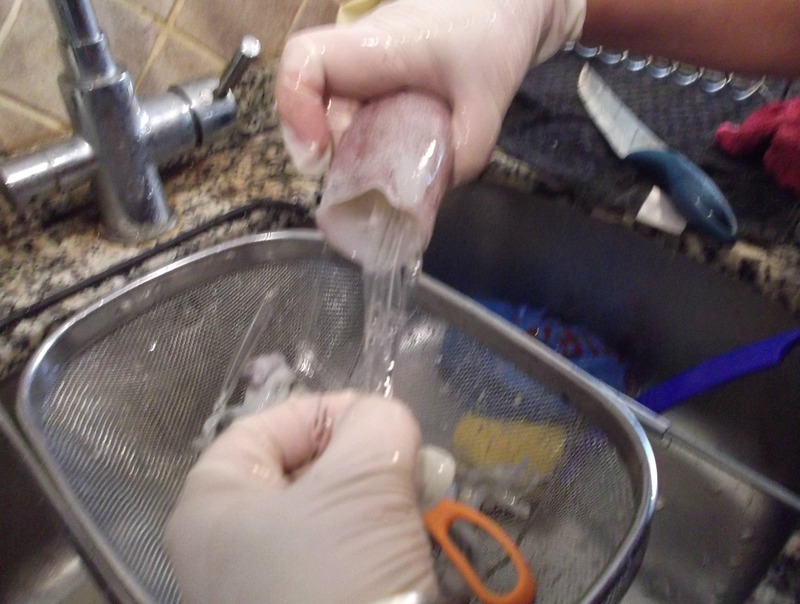 Great instruction on cleaning squid. I love it and it gets a thumbs up by all family members so I really ought to cook it more often. Oooh – good to find more fans of squid! what a great HOW TO! I have seen some professional chefs get this wrong! High praise indeed as I know you have seen some pretty impressive chefs at work. Thanks Tandy! 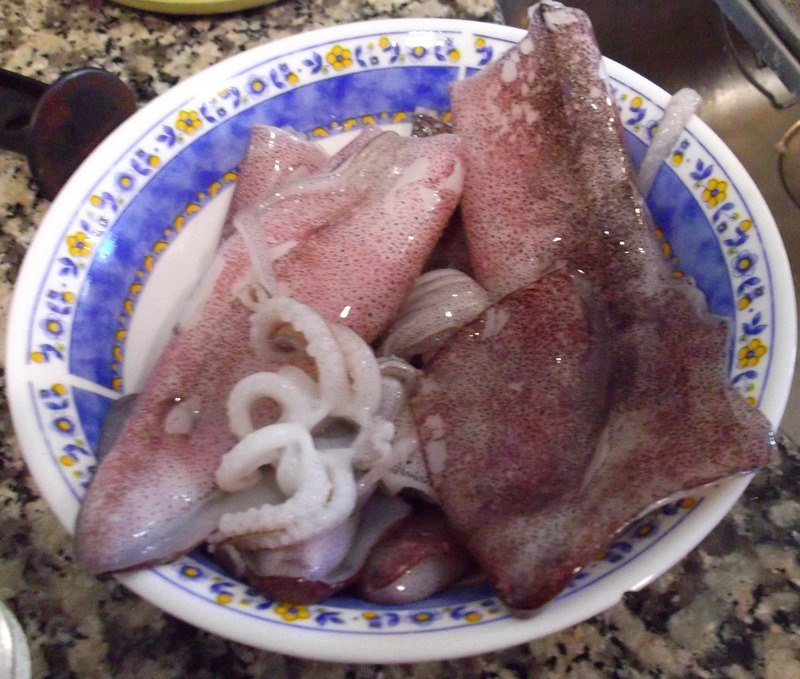 I love squid and we were fortunate to have enjoyed it a few times during our holiday travels, mostly because we were in coastal areas. Glad you´ve managed to enjoy squid on your travels. Ok, I´ll stop blaming Big Man – he actually takes most of the “finished” food photos as his seem to come out better than mine! It seems some of the best of foods need only salt, olive oil, parsley and lemon. Perfectly example here. I don’t think I’ll ever DO this – Im just a bit squeamish on such things. But I’d EAT it, that’s for sure! And I loved the tutorial all the same! Eating is the most important bit – and done simply like this the flavour really shines! Or you could buy them frozen…much easier! I just love the nail polish under those gloves ;0) that made me smile. 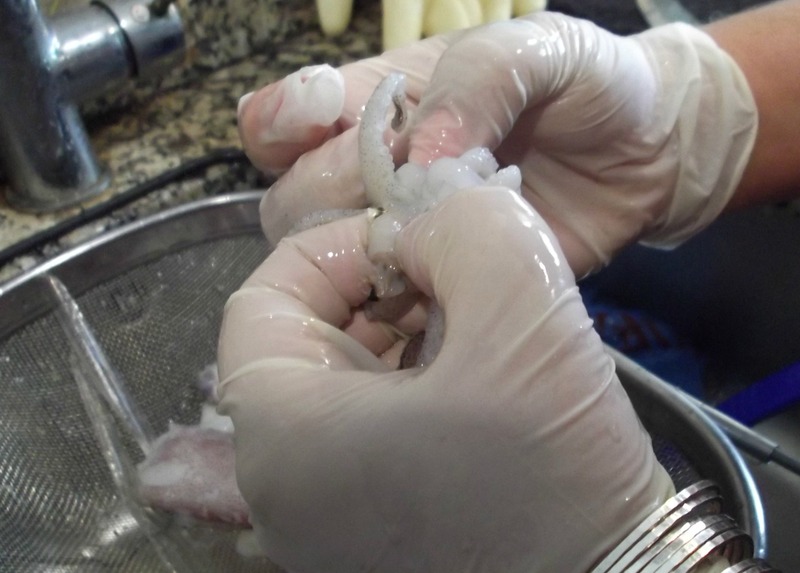 Great tips, we don’t get fresh squid here but I’ll keep the knowledge stored for another day. I am lucky in two ways. The market where I buy my seafood offers squid three ways, whole, bodies, and legs. If I can only find them whole, my husband does the cleaning. No messy body parts for me. Lucky indeed – I´d be buying all the legs as I love them! Fantastic, I love squid, especially the tentacles! Thanksss!